Fall Y’All was off to an excellent start and even the stormy weather couldn’t put a damper on the fun! Starting us off was story time with Mike Turpen, who read Born on Broadway. The kids really enjoyed getting to interact with Mr. Turpen and his story, while also learning from him a little bit about Oklahoma’s own Broadway star, Kelli O’Hara! Next, our guests loved their chance to become Broadway stars themselves! 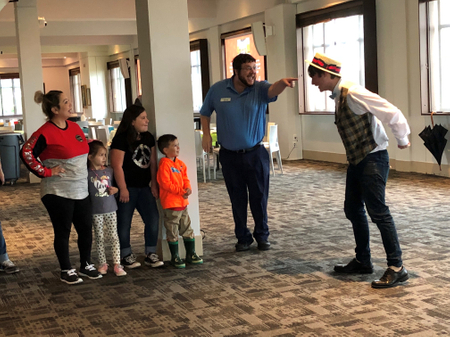 Thanks to our partners from the Lyric Theatre of Oklahoma, we were treated to a performance from the hit musical The Music Man and then everyone got a chance to be a part of the show! Watching our guests, and even our own team members, become Broadway actors and march about the room in a parade was truly a joy to witness! Scroll through the fun on Broadway Day below!